"Men are in charge of women by [right of] what Allah has given one over the other and what they spend [for maintenance] from their wealth. 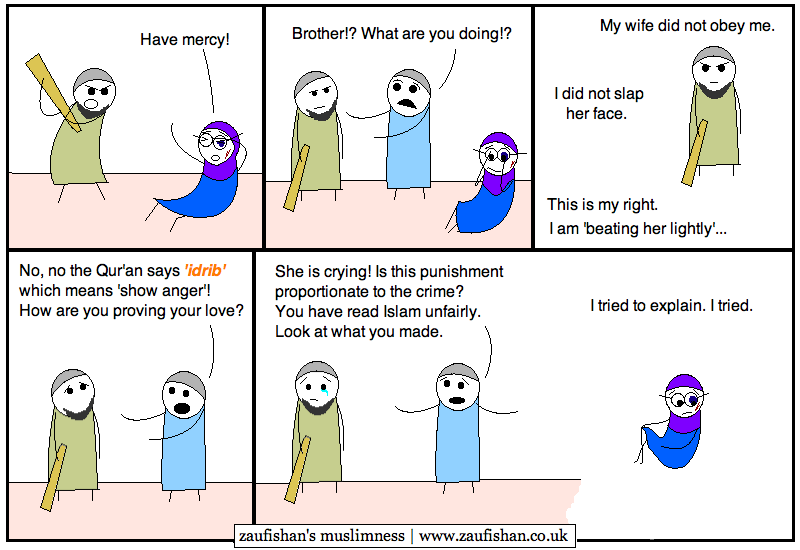 So righteous women are devoutly obedient, guarding in [the husband's] absence what Allah would have them guard. But those [wives] from whom you fear arrogance - [first] advise them; [then if they persist], forsake them in bed; and [finally], strike them. But if they obey you [once more], seek no means against them. Indeed, Allah is ever Exalted and Grand." This was pretty sad. Unfortunately, a lot of translations of the Quran have "beat" in this ayah. The word can be translated in many ways and has to be understood in context. It's pretty sad how people take advantage of the word of Allah for their own benefit. Something about this makes me genuinely sad...very, very sad...I have no clue. Maybe it's knowing that it happens so much in my own culture and homeland so often, yet all I do is sit here and let it happen? We ARE raising awareness by campaigning against domestic violence. Sisters take self-defense classes here in the Ukay, more brothers come forward to support DV groups and more families are receiving counselling hamdulillah. This problem comes from our acceptance (and lack of independent questioning) of clearly unjust interpretations of Divine Rules and revelation; the miracle of a deep language such as Arabic means that unlike English that has 5-10 words for one entity, the Qur'an has 30, 50, 70 for the specific grammar to an entity. 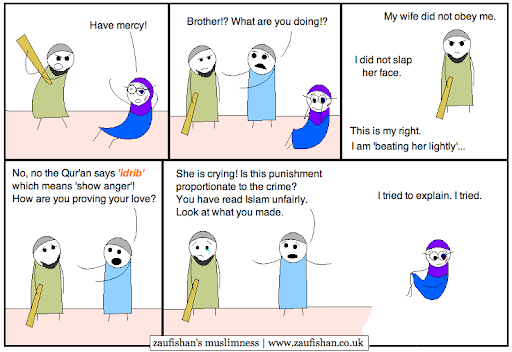 Here, in surah 4:34, we accept the English that is culturally interpreted to 'beat the cr*p out of your wife, however, whenever'. The Shari' ruling on this is very, very different. Jzk, this will be a war of attrition, against chauvinist males, on the surface. But ultimately, I just want to protect all those unfortunate sisters that were given these ever so 'manly' husbands.